Should You Consider Annual Service? Properly servicing and cleaning your office equipment will help lengthen its lifetime. You want to avoid using canned air because this can blow the dirt, dust and other debris into hard to reach areas that even a trained technician cannot remove. 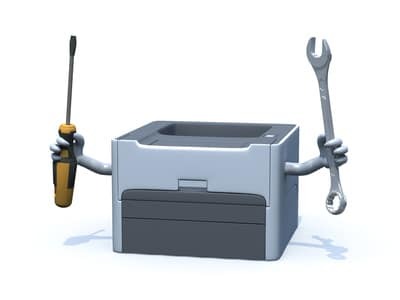 At the minimum, you want to have your copier serviced annually, and if you work in a dusty environment with a lot of traffic, then you may want to service the copier every six months. The biggest reason to look at regular service is because the dirt and debris can be abrasive to the moving parts, and that can cause anything from lower printing quality to the paper jams. The longer dirt gets left in the environment, the increased chances you have of lower print quality. In many cases, a dirtier machine consumes a higher level of toner because it has to work twice as hard. Annual service can also catch expensive breakdowns before they cost you thousands. Many users of office equipment have wondered if they should check their equipment for regular cleanings and servicing. Preventative maintenance becomes a necessity to better performance, and it will prolong your machine’s life. The parts will last longer, and your toner will also last longer. When your machine performs at the highest levels, you extend your toner. Technicians have the know-how to keep your office equipment functioning. Avoid using canned air because this can have a dramatic impact on quality.